Above: The sailboat logo on a trash can near City Hall. The 1970s-era boat now emblazoned on trash cans, highway pillars, city vehicles and letterhead is, of course, a take on the "City of Lakes" motto. But its origin story has proven elusive even to city staff, who could say only when it first appeared on official stationery. Former council member Denny Schulstad (pictured at right in 1975) was working in the city's two-person public affairs office in the early 1970s, a job that largely involved dealing with the media, writing press releases and crafting a weekly employee newsletter. The city's stationery at the time featured the city seal at the top and the skyline at the bottom. Above: The skyline as it appeared on early 1970s stationery. But the Foshay Tower was about to get a 300-foot taller sibling. "The IDS tower was getting built," Schulstad recalled. "So Fred [Kobler] and I looked at that and we said, 'Well we’re going to have to add the IDS tower to [the stationery].' And when we looked at that it was ridiculous." The IDS dwarfed its smaller counterpart, rising high on the page. This prompted some bigger thinking about redesigning the stationery and conveying the existing City of Lakes brand in a new, more versatile logo that could also be affixed to calling cards, Schulstad said. They considered using the outline of a lake, but realized that Minneapolis' lakes don't have very unique shapes. "Then we thought, 'Our lakes are restricted, it’s only for canoes and sailboats. You can’t use a powerboat on a Minneapolis lake,'" he recalled. "So we thought about a canoe. That just didn’t look very good. So then we thought, 'Well how about a sailboat?" So the two men, neither of whom had design background, went to work with a compass, some black paper and an X-Acto knife. Neither thought they were creating anything more than an icon for stationery and business cards. Above: The city's brand new sailboat logo on a piece of letterhead from the desk of Mayor Al Hofstede in 1975. Yet one mystery endures. 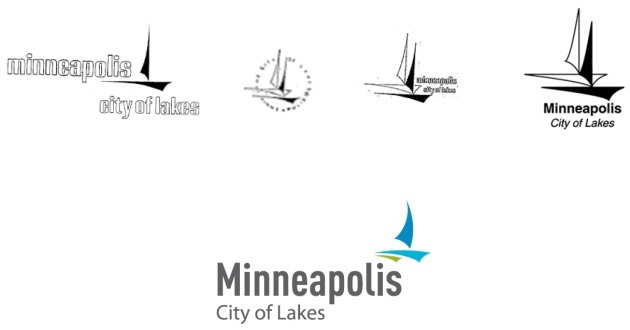 Schulstad said their intent was to replace the skyline altogether, but mid-1970s letters at Hennepin County library show it survived -- updated to include the IDS Tower -- below the new sailboat logo. Above: The bottom of a piece of stationery sent in 1975. City Clerk Casey Carl, whose office keeps extensive records about the city stationery, said the City Council formally adopted the skyline and sailboat stationery in 1984. Efforts later that year to change the logo were rebuffed by the council. A year later, the council approved two allowable versions of the city letterhead -- both with the sailboat, but one without the skyline. Eventually the skyline faded away from city letterhead altogether, and the sailboat multiplied. "It was a phasing thing," Schulstad said. "And I think probably what Fred and I were told was, 'Hey, let’s design something new.'" Some have recently questioned whether sailboats are the best representation of the city, given how few people use them. Ironically, Schulstad said he has never sailed on the Chain of Lakes. "Sailboats, whether one or two, tell only part of Minneapolis’ story," wrote designer Julia Curran on her blog blog Happify Design, referring to the elimination of one boat in more recent designs. "They’re a luxury hobby, with limited access for those in Minneapolis ... Less than one tenth of one percent of Minneapolitans could have a sailboat in our city." Curran added: "Updating Minneapolis’ visual identity provides an ideal opportunity to look at who we are as a city and who we want to be. It’s a time to reach out to all residents and start a dialogue about what it means to be part of Minneapolis." Rethinking the entirety of the logo wasn't part of the recent modernization project. But responding to Reich's concerns during a recent committee discussion, communications director Matt Laible said brands should be consistent. "We think there's real value from a branding perspective in maintaining an identifiable look," Laible said. "A logo really is a visual signature that people recognize." Below is a city-created graphic outlining the evolution of the sailboat over time, including the new logo at the bottom.